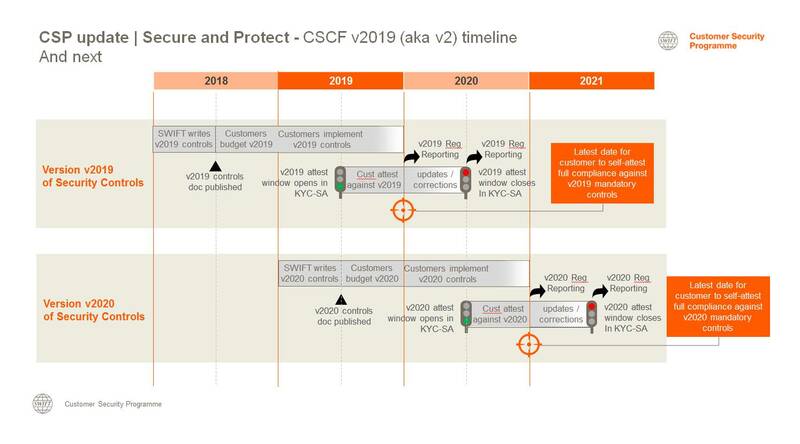 Are you ready for 2019’s SWIFT Customer Security Controls Framework (CSCF)? 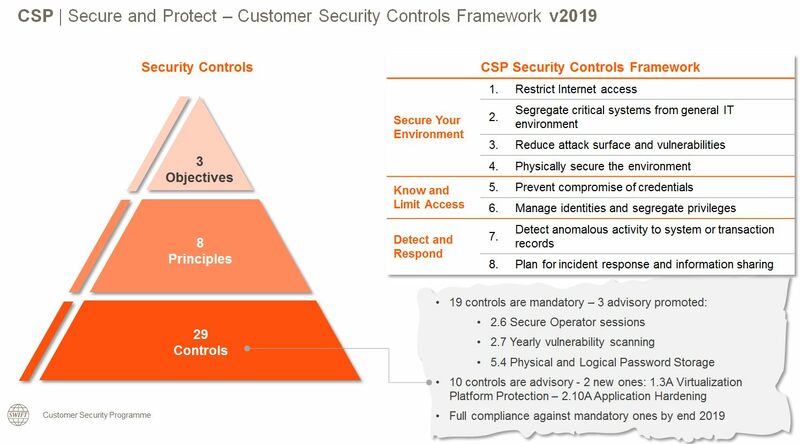 SWIFT announces updates to the Customer Security Controls Framework for attestation in 2019. The growing threat of cyber attacks has never been more pressing. Recent instances of payment fraud in banks local environments demonstrate the necessity for industry-wide collaboration to fight against these threats. Cyber attacks are becoming increasingly sophisticated in the financial community. The persistence of such threats underlines the importance of remaining vigilant and proactive over the long term. While customers are responsible for protecting their environments and access to SWIFT, the Customer Security Programme (CSP) has been introduced to support customers in the fight against cyber fraud. SWIFT has established the Customer Security Programme (CSP) to support customers in the fight against cyber-attacks. The CSP is articulated around three mutually reinforcing areas. Banks will first need to protect and secure their local environment; it is then about preventing and detecting fraud in their commercial relationships and continuously sharing information and preparing to defend against future cyber threats. The growing number of cyber-attacks, including those on local SWIFT infrastructures, has prompted SWIFT to promote some advisory controls to be mandatory controls for SWIFT participants to fight cyber threats. Additional guidance has been added to some controls, such as 2.4A Back-office Data Flow Security, 4.1 Password Policy, 5.2 Tokens Management, 7.3A Penetration testing. Organizations should examine and investigate their current environment – beyond the traditional security-log analysis – to determine whether they have already been attacked, or at least targeted, by this threat actor. The new CSCF can now be consulted but will only become effective in the KYC-SA, the online repository for customer attestations, in July 2019. All SWIFT users must attest against the mandatory controls of this new version by the end of 2019.